Entering in prayer with the God of the Universe places you and me in the realm of “make it happen”. Have you noticed? Right there is the place where forgiveness begins, both as receiver of forgiveness, and as the one able to melt icy grips to be a deliverer of forgiveness. It is the place where interference from The Rock stops toxic vibes, and delivers love into our cells … emotion cells, physical cells, mental cells … all receive healing love, restoration love. In that same birthing place of love, every single time you enter into prayer, you are opening up new order that you and I did not create … God Most High’s heavenly order gets revealed. Yes, every time I enter into prayer, my God sets me outside of my pea-brain to a place where His order is affirmed again … He shows me by looking back at times of chaos and mayhem in my life, it had to happen in me for certain truths to erupt and for spiritual growth to happen. 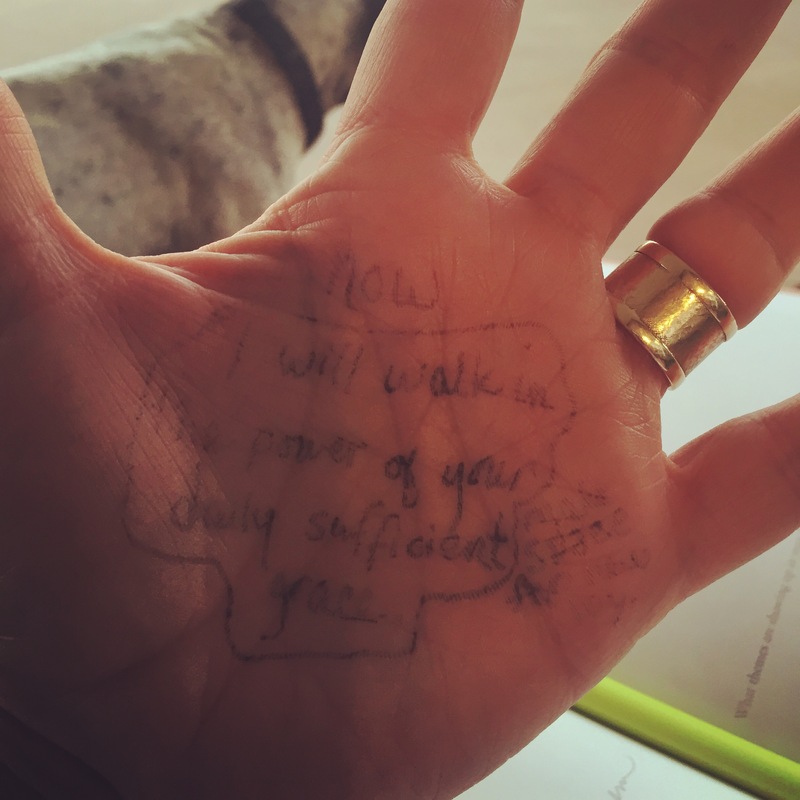 On my hand, the past week, I’ve been writing lyrics from a song, “I will walk in the power of Your daily sufficient grace.” Knowing that no matter what, sitting tightly on The Rock, is my assurance – He holds you and me steady there, and reminds us His order is perfectly in action. Wake up. Enter prayer. Go.